"I just thought I was dull." Reddit user Andy Bowen could be forgiven for his frank assessment of his online presence. I'm sure we all know the feeling of posting something quite clever online only to feel a bit rubbish when nobody seems to notice it. But what separates Bowen from the rest of us is that he kept posting when faced with silence for an entire year - only to find out he'd been mistakenly "shadow banned" the entire time. In other words, though the 34-year-old could make posts and comments on Reddit, absolutely nobody could see them. After getting in touch with Reddit support about the problem, discovering the mistake, and then publicly posting about what has happened, Andy has become an overnight sensation with the most "liked" post on the website on Wednesday. 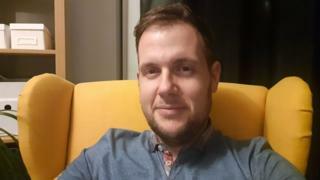 More than 123,000 people have "upvoted" his post (Reddit's version of "likes"), with many more paying to give him special rewards - which at the time of writing amount to roughly three and a half years of the website's premium service. "I'm having a very strange day," Andy told the BBC. "I felt quite amazing when someone noticed one of my posts. "I didn't realise it was going to blow up like that - and I had a very frantic quick search in the morning to see if I had to delete anything embarrassing. "People were quite shocked why I wasn't more angry about it, but a moderator contacted me to explain I'd been caught up in an attempt to stop attacks on the website. "They blocked an IP address or account they thought I was linked to, that's it really. I was just so glad it was cleared up." Andy said that for a long time he didn't understand why people weren't commenting on his posts, and highlighted one that he was disappointed nobody saw at the time. "There were a couple of posts on the diabetes forum," he said, "where people had asked questions that I had the answers to. "There's one specific one where someone was putting out a cry for help. Mine was one of only two responses. "It's gone now, they obviously never saw my response, and I don't know, you never know what's happening to the person behind it. "I wonder how would my contribution have changed them during that time." Andy explained he kept posting simply because he enjoyed contributing to discussions, even if he wasn't getting anything back. "Rather than just sit around and look at social sites I like to do something a little more active and - ironically - interactive. "In the end it took me a long time to contact Reddit support, and they solved it within six hours really." Comparing his year of social silence to his day of fame, Andy said it was "absolutely worth it". "I've had a really funny day of content," he said. "I've had lots of good interactions with people, really good conversations about real lives. "What I don't want to do from this is make any money, so I'm going to contact a charity to see if I can do anything with crowdfunding. "I'm going to try and turn this strange situation into something real."